One of the core challenges in linguistics is elucidating compounds—their formation as well as the reasons their structure varies between languages. This book on Modern Greek rises to the challenge with a meticulous treatment of its diverse, intricate compounds, a study as grounded in theory as it is rich in data. Enhancing our knowledge of compounding and word-formation in general, its exceptional scope is a worthy model for linguists, particularly morphologists, and offers insights for students of syntax, phonology, dialectology and typology, among others. The author examines first-tier themes such as the order and relations of constituents, headedness, exocentricity, and theta-role saturation. 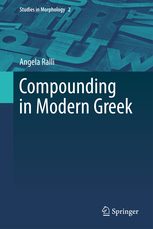 She shows how Modern Greek compounding relates to derivation and inflection, and charts the boundaries between compounds and phrases. Exploring dialectically variant compounds, and identifying historical changes, the analysis extends to similarly formed compounds in wholly unrelated languages.